I have a little beauty for you. Its an envelope pouch made using Soft Suede card which has been given texture using the Subtle Embossing Folder. 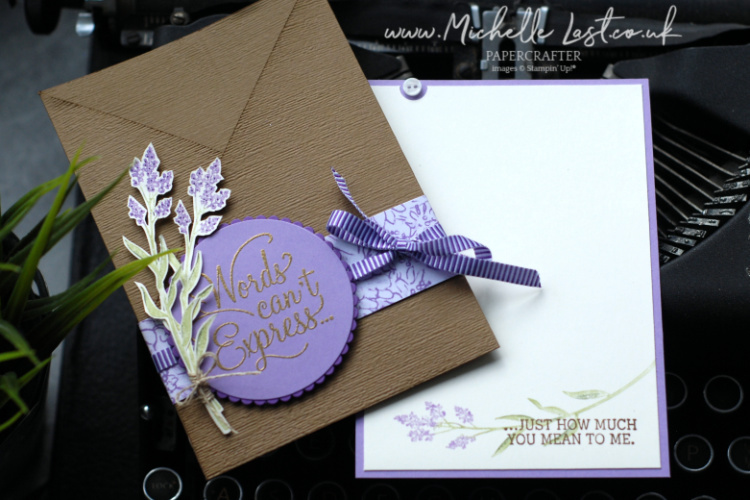 Paired with Gorgeous Grape and Highland Heather and the beautiful Dear Doily stamp set I think it looks stunning. To be sure to get your hands on your retiring favourites pop on over to my online shop at 8pm and click the retiring list (last chance list) and pop the items in your basket that you cannot live without as once they are gone they are gone. Some of the products from the current Spring and Summer Seasonal Catalogue are going into the new Annual catalogue but most are not, including the Dear Doily, so if you love this set, there are no guarantees it will be available till the last date of the seasonal catalogue which is 3rd June. Cut a piece of Soft Suede to measure 29.7cm x 15cm. 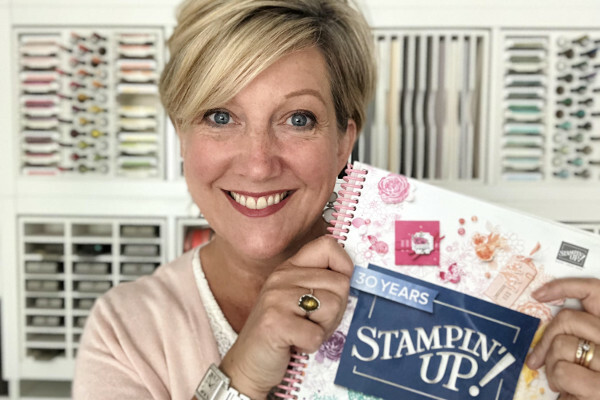 Emboss with the Subtles Embossing folder. Score along the longest edge at 9.9cm & 19.8cm. Cut two diagonal corners of the outside rectangles and glue to create a pouch. Cut an inner piece of Highland Heather to measure 9.5 x 14.8cm and a piece of Very Vanilla to measure 9cm x 14.3cm. 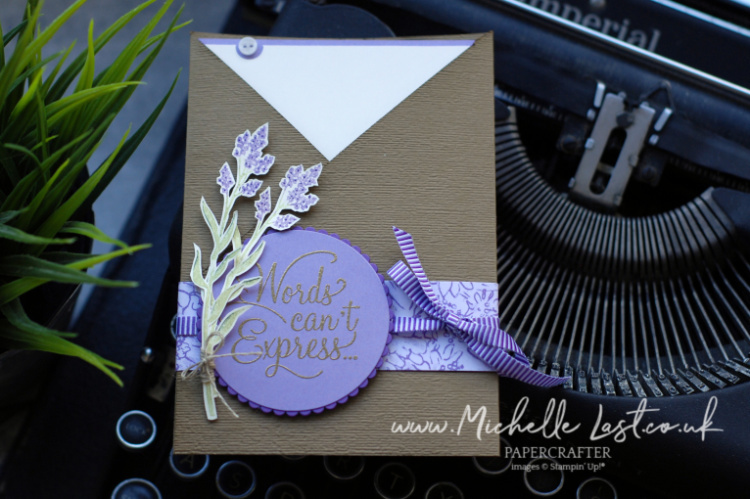 I stamped the Lavender using the Pear Pizzazz and Highland Heather Stampin’ Write marker and hand cut around it as I don’t own the dies. I added some dots on the lavender using the Gorgeous Grape Stampin’ Write marker. Wrap a piece of coordinating DSP around the pouch (mine was from the free paper from Sale-a-bration). Tie coordinating ribbon around the Designer Series Paper. Heat Emboss the greeting in gold embossing powder from the Dear Doily stamp set. Die cut the greeting and a coordinating scallop circle from the Layering Circles Framelits. Attach the greeting circle to the front of the card and tie the lavender bundle with lined thread and attach to the front of the card. Stamp another heather on the inside of the card and the matching greeting from Dear Doily stamp set. Punch out a little circle and add a button to the insert. All the items I used to make this Dear Doily Pouch Card are shared in the table below. Click any of the images to go to that item in my online shop and add it to your basket and checkout asap to ensure you get your hands on the retiring goodies and the last chance items. Please enter the monthly hostess code if placing an online order with me to receive a free thank you card and gift as I really do appreciate your business.